For a city of just 30,000 residents, Paso Robles has an amazing number of fabulous restaurants, many of which are right on the city square, just a stone’s throw from each other. Take it from someone who spends a lot of time each year on the road in wine country. There are a number of wine regions all over the world I can think of that can’t hold a candle to Paso when it comes to great places to eat. There was quite a buzz when I was in town about Artisan’s new location and the cocktail program. I normally only drink water at night when I am on a tasting trip, but every now and then it’s fun to mix things up. The bar scene at Artisan can only be described as lively. Open doors and the cool Paso evening breeze add to the great ambience and energy in the room. General Manager Daniel Green, whom I had first met at Eleven Madison Park in New York years ago, is now in charge. He brings to Artisan the highest level of professionalism mixed with plenty informal, easygoing charm, an approach that works brilliantly. It’s great fun to sit at the bar and watch as drinks and cocktails are prepared. Artisan’s Hotel Nacional Special is dominated by pineapple and lime. It is too sweet for my taste, at least in this setting. A little more reserved, the Pendennis Club is soft and floral, with a lot of peach character, but it, too, is very sweet. I guess I am more of a wine person. Dinner is more up my alley. The razor clams are absolutely delicious. Blood orange, olives and Espellete pepper add acidity and brightness to the fried clams, while the thinly sliced celery is cool and refreshing. 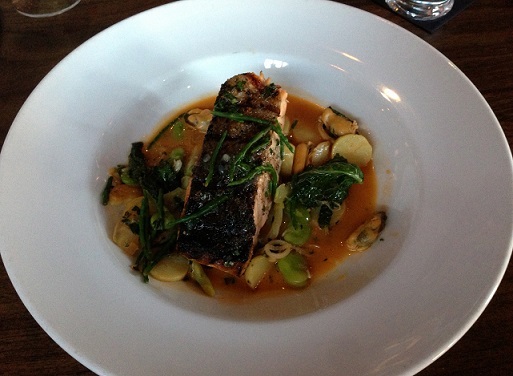 Artisan’s grilled salmon, served with new potatoes and a mussel broth, is equally tasty. The salmon is cooked a perfect medium-rare, while all the elements are nicely balanced on the plate. 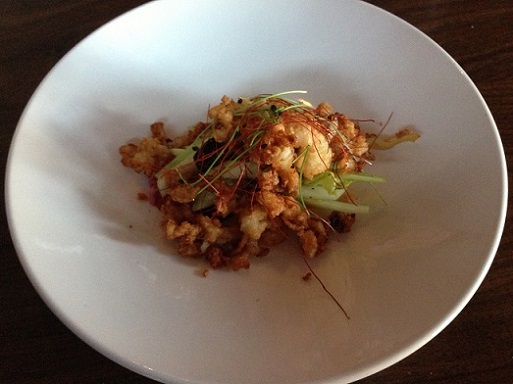 Both dishes make for wonderful early dinner at Artisan’s new bar.